I’m going to take the arguments one at a time. In the interest of space, I will summarize each argument. I encourage my readers to examine the letter, to verify my summary. I. The letter argues that the legal basis for the establishment of the State of Israel is the League of Nations establishment of the British Mandate in 1922. The point is to both eschew the UN Partition Plan of 1947 and to use a legal basis that “includes Judea and Samaria,” i.e. the West Bank. There are two problems with this argument. One is that the Mandate at no point speaks about establishing an independent Jewish state, but adheres to the Balfour Declarationlanguage of a “Jewish national home” which would not impinge in any way on the civil and religious rights of the Arab population. Clearly, the clearing of Arab towns in the `1947-49 war, and, more importantly, the legal decision to bar their return did impinge on the rights of the Palestinians. Map of UN Partition Plan. hard to imagine who thought this would be viable. 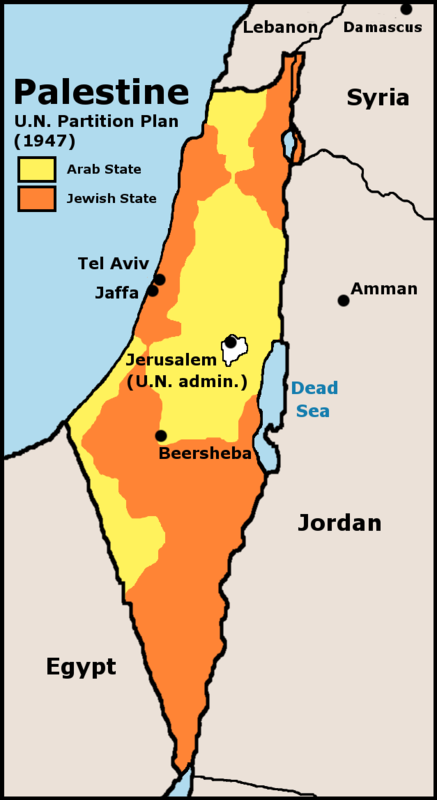 Moreover, the fact that the Mandate covered all of historic Palestine, less the area that became Transjordan and had been separated from the rest of Palestine a year earlier by fiat, does not in any way imply that a “Jewish national home,” even if one accepts it being defined as an independent Jewish state, would be constituted over all the territory of the Mandate. In fact, the 1947 Partition Plan that the letter is intentionally trying to bypass, clearly demonstrates that such was not the intent and that the nascent State of Israel accepted that outcome. In short, the League of Nations Mandate certainly does not provide a legal basis for Israel’s existence, much less any affirmation of the legitimacy of its control of the West Bank. That legal basis is found in Israel’s Declaration of Independence and the world’s recognition of it. II. The letter argues that Article 80 of the UN Charter affirms League of Nations commitments. True, but the commitment the letter claims is false. Moreover, League of Nations commitments can and have been overridden by subsequent UN actions, and this was certainly true of UNGA 181, the Partition Plan. Do they really want to make this argument? A fundamental principle of the UN has been the oft-cited “inadmissibility of the acquisition of territory by war.” Take that together with invalidating the 1967 lines and it would mean that Israel would have to withdraw all the way to the 1947 Partition Plan lines. International de facto recognition of the 1967 lines is a favor to Israel, not a prejudice against it. Again, nothing in any proceeding of the League of Nations or the United Nations gives even a hint of title to the West Bank to Israel. Arguing that the Armistice Lines (which, in fairness, really is a more precise term than the “1967 borders”) should not be a referent leaves only one other option that has ever been demarcated as Israel—the Partition Plan borders. This doesn’t preclude UN recognition. Indeed, the fact that Israel has never negotiated in a manner that included the Palestinian right to a viable state demonstrates the need to do something to even the odds, even in a small way. UN recognition enhances the prospects for talks, it does not diminish them. Moreover, the fact that Israel has never had declared borders shows that a state can be recognized while the borders are still up for discussion. All a UN recognition would do is strengthen the ’67 borders as the starting point for such talks, which also enhances the prospects for productive discussions. V and VI. The letter argues that a UN vote would contravene the Interim Agreement of the Oslo Accords which mandates that neither side would act to change the status of the territories in question. It further argues that the settlements existed prior to the Oslo Accords, that the Accords did not preclude settlement activity and that settlements were to be a final status matter, dealt with through negotiations. The writers here touch on a key point of Palestinian failure in Oslo. Indeed, the Accords did not expressly forbid settlement activity. It is only the very point the authors cite – that neither side was to do anything to change the status of the territories – that the Palestinians expected, in their immeasurable naiveté, would prevent settlement expansion. That said, Israel constantly uses the argument of “demographic changes” to explain why they can’t go back to the 1967 borders, a position most recently supported by President Obama. This is an attempt to have it both ways—Israel argues that Oslo prevents Palestinian action, but that same prohibition doesn’t apply to settlement expansion, which clearly, as Israel’s own claims demonstrate, enact changes on the ground that would be far more impactful than the UN vote. A UN vote would not make a significant change in the status of the Territories. All it would do is mean that Israel is occupying land that is not its own. The High Court in Israel has deemed the territory as being “under belligerent occupation,” and both Ehud Olmert and Ariel Sharon have called this an occupation. Therefore, a UN vote changes nothing in terms of the territories’ status; the land is under military occupation either way. It makes a political change, adding international pressure on Israel to negotiate in good faith. But it does not change the West Bank’s status. VII and VIII. The letter argues that the Oslo Accords were witnessed by the UN and several significant nations, and that the UN has consistently refused to recognize Israeli sovereignty over East Jerusalem. Therefore, the authors argue, it cannot go back on the Oslo Accords nor can the UN endorse Palestinian sovereignty over East Jerusalem. This is a strawman argument. As we’ve seen, the UN vote would not contravene anything in Oslo. And the issue of Jerusalem can remain open. Much of this depends on how the resolution is worded. It can easily leave the status of the Old City for negotiation, while otherwise calling for negotiations to start with the 1967 borders and that this is the basis for a Palestinian state. Again, the borders need not be fixed, as Israel’s own situation proves. The letter closes its argument with a threat that Israel will annex the West Bank, which we’ve heard before. The Palestinians face legal obstacles to a UN vote for statehood, and all the more so because their real goal is admission to the UN, something the Security Council has a clear mandate over. But the legal arguments that some alleged “scholars” are advancing here only serve to demonstrate just how weak the case against a Palestinian state really is. Great, so we are back to square one. 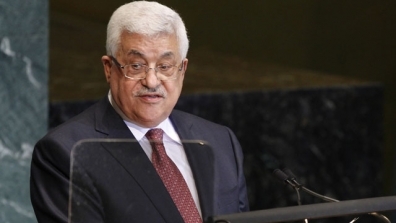 If the PLO can’t get a recognition (and they won’t), what can they do? Until and unless there are honest peace brokers, nothing can be done and Isreal will happily continue with its annexation of occupied land. This is a fine analysis — it should be sent to the G8 while they are busy removing any mention of the 1967 borders from their statements. Even in my pro-Israel days I thought that the partition borders were the only clear and unarguable borders. But even then I was keen to see a bi-national, multi-cultural state. I never heard this claim you make! Please provide some evidence of this! The fact is it was the Arabs who were fleeing at the request of the Arab leaders. Who promised them that the vast Arab armies would return and wipe the Jews into the Sea! In addition, the had offered a two state solution to the Arabs and they rejected the idea and attacked the newly formed UN approved modern State of Israel.The Jews wanted the Arabs to stay and become part of Israel. Are you saying this is wrong? Prove it? I don’t buy it! Since OSLO the PA have violated every peace negotiation with the Palestinians. From the Mitchell Plan, the Tenet plan, Land for Peace, the Road Map, they violated every effort and this should come as no surprise because even when Arafat was leader peace was never close. Peace with Israel would have been the end of Arafat! The militant groups would have killed him! And even now with all these Peaceful Jews who fail to realize Israel has a right to defend itself. The Palestinian Charter still calls for the destruction of the State of Israel. The Jews here are misguided in their efforts and are betraying the idea that Israel or any country would never put up with rockets fired into their country. So they act like brokers by taking the side of the Palestinians? What a load of crap! These Jews act like they are holier than other Jews who want to see peace but will not give into Palestinian threats and attacks. I will fight to the end! You chumps can believe in giving an olive branch while the Muslims hand you your heads! Most intellectuals know good and well a Palestinian State will lead to a new Militant state that still wants to destroy Israel. And you people give them the ammunition to do just that!